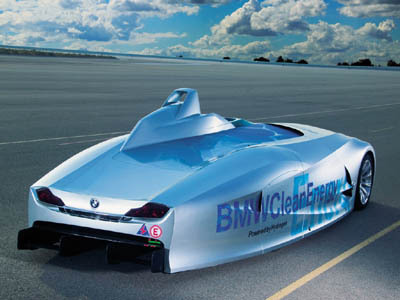 BMW's hydrogen-fueled H2R set nine world records for cars powered by a hydrogen-fueled internal combustion engine. With a top speed of more than 185 mph, the H2R is not destined for mass production, but does help develop cleaner powerplants for production models. The gorgeous aerodynamic body of the H2R was styled at BMW Group DesignworksUSAs Newbury Park, Calif. studio.